Jeremiah Langhorne is the chef and partner in The Dabney, located at 122 Blagden Alley NW in the Washington, D.C.’s Shaw neighborhood. Langhorne returned to his mid-Atlantic roots in this new restaurant venture after five years at McCrady’s restaurant in Charleston, South Carolina, where he worked as chef de cuisine under Executive Chef Sean Brock. He focuses on modern American food with strong regional and historic influences and incorporate his interests in foraging, charcuterie and farming. 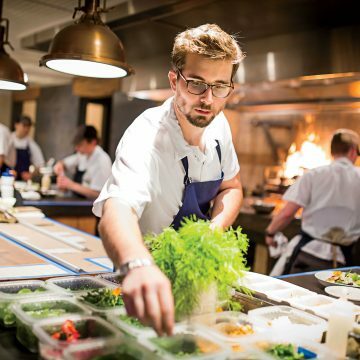 Langhorne’s first foray into the restaurant world was an externship at the acclaimed OXO restaurant in Charlottesville, where he learned under the classically trained English Chef John Haywood and soon became a part of the kitchen staff. By the time he left, Langhorne was executive sous chef. Langhorne came to the Southeast to stage at McCrady’s in 2009. After completing a two-month stage at Noma in Copenhagen, Denmark, Langhorne returned to McCrady’s to take over as sous chef. He was promoted to chef de cuisine in spring 2011.
Notable recognitions for Langhorne include being named as a member of the inaugural Eater Young Guns class in 2012, being chosen as one of the “Top 5 Rising Chefs in the US” in 2012 by Gayot and being featured in the “New + Notable” class at the 2013 Charleston Wine + Food Festival. The Dabney was also a semi-finalist for the 2016 James Beard Foundation Award for Best New Restaurant, was named one of Bon Appétit magazine’s 50 Best New Restaurants of 2016, and received a Michelin star in Washington D.C.’s inaugural Michelin Guide in October 2016.